Mr. Ley, 46, was killed at about 9am while reading a newspaper at the coffee shop in the gas station on the corner of Monivong Boulevard and Mao Tse Tung Boulevard in Phnom Penh’s Chamkar Morn district. Mr. Ley was shot twice, once in the back and once in the left side of his temple. Police later chased down and shot at a man wearing a dark blue uniform covered in spots of blood, eventually arresting him near the Svay Pope Pagoda in Chamkar Morn district’s Tonle Bassac commune. The alleged gunman told police his name was Choub Samlab, which means “meet to kill” in Khmer. The 38-year-old said he killed Mr. Ley because he owed him money. “He borrowed my money for more than a year without paying and I bought the gun from Thailand. He [Mr. Ley] borrowed my money to help the people,” the man told police. 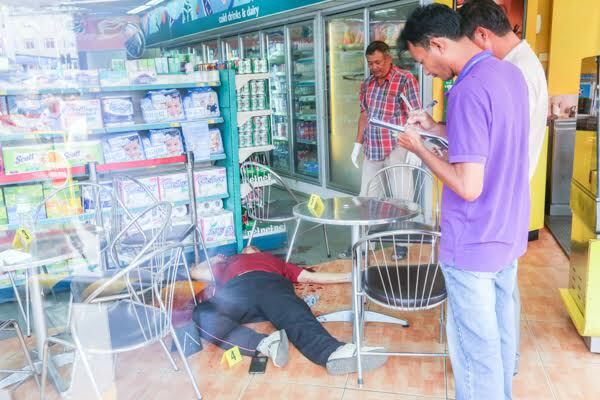 Phnom Penh Municipal police chief Chuon Sovann said the gunman used a Glock pistol to shoot Mr. Ley and told reporters police were convinced he was the shooter after interrogating him. After further investigation, he said, police found more clues tying “Mr. Samlab” to the shooting. The Ministry of Interior later released a statement saying the man was from Banteay Meanchey province’s Svay Chek district and worked as a crop farmer in Sa Kaeo province, Thailand. “Police are not allowed to report anything while they are still investigating, but we have enough evidence. The name of the perpetrator is difficult to believe. We have never met someone named Choub Samlab,” Mr. Sovann said. Some eyewitnesses who worked at the gas station were brought in for questioning, but all were released. Srey Nuch, a Star Mart employee, told Khmer Times yesterday that Mr. Ley came to the cafe at 9am as he usually does. He drove his white Lexus to the mini-mart alone and bought a coffee and a newspaper. He had been sitting down for five minutes when the shooting occurred. “I did not look at the killer because he wore a cap and shot him from behind so he fell down at the scene,” she said. A cleaner who worked at the gas station said she was standing about one meter away from Mr. Ley when the shooting happened. Neither man spoke to each other beforehand, she said. “I stayed near him. I just heard the sound like ‘bang’ two times and then I shouted and cried. No one dared to help him,” she told Khmer Times. A man who spoke on condition of anonymity said he was sitting behind Mr. Ley when the shooting took place. He said the man walked into the cafe, shot Mr. Ley from behind, turned him and shot him again in the head while facing him. A security guard at the gas station said he saw the gunman walk out of the cafe carrying a gun as witnesses nearby yelled “thief, thief” at him. Police near the traffic lights then chased the man down. One attendant said Mr. Ley frequented the gas station and often drank coffee there. “I noticed that every Sunday, there are lots of guests. But today was strange because not many guests came. Some people said electricity at the station was cut, but that was wrong. The power was on and the security camera was on,” he said. After the incident, police took the security camera footage from the gas station to “investigate it.” More than 300 supporters who knew and loved Mr. Ley gathered at the gas station. 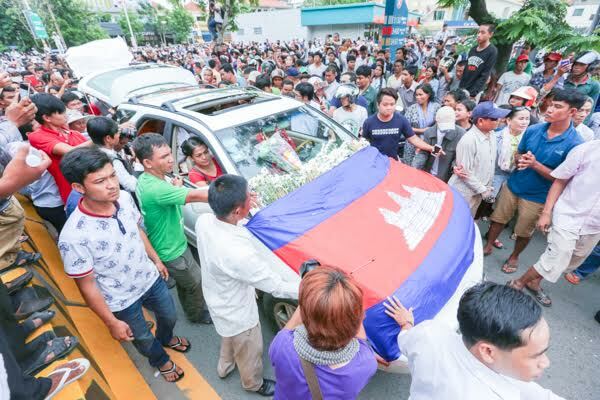 His body was taken from the scene, put into his own car at 3pm and the car moved slowly up Monivong Boulevard, followed by thousands of people. The car eventually made its way to Wat Chas pagoda in Chroy Changva commune. 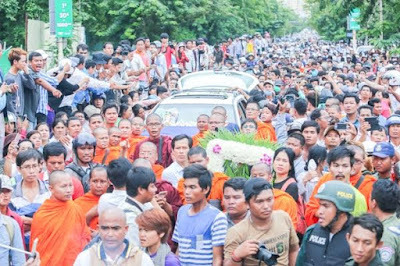 Civil society organizations, political parties and government leaders released statements expressing remorse and regret about Mr. Ley’s death. Many called for an independent investigation into the shooting. Mr. Ley was a frequent critic of Mr. Hun Sen and the government, often taking them to task for a variety of issues, most recently the Global Witness report tying the prime minister’s family to many of the country’s biggest corporations. Sam Rainsy, the President the opposition Cambodian National Rescue Party, posted on his Facebook page that the crime was politically motivated. Suon Bunsak, chief secretariat of the Cambodian Human Rights Action Committee, expressed his sadness at the loss of Mr. Ley. “I dare not the say the case involved politics, but he is a public figure and analyst who dared to criticize politicians. I admit that this made me scared, but I will keep on doing my job. I will comment on any public issue that I have enough evidence to support,” he said. Last week, Mr. Ley appeared in a roundtable discussion on two radio programs, RFA and VOA, to discuss the Global Witness’ report called “Hostile Takeover.” The report alleges Prime Minister Hun Sen and his family had acquired massive personal fortunes over the years. 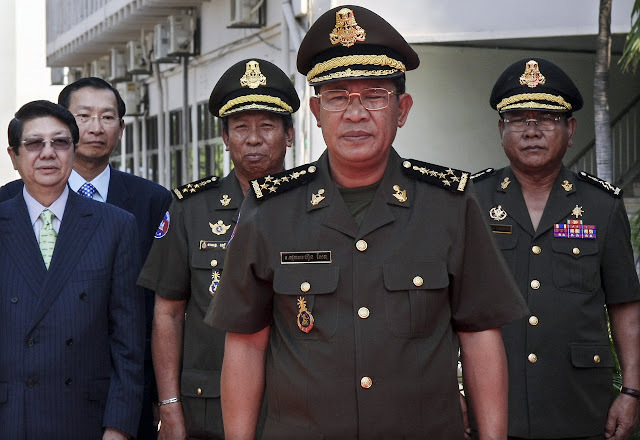 “Cambodia has a long history of political, human rights and labor activists being killed, with murderers rarely brought to justice,” the NGO wrote. Mr. Ley was born on October 19, 1970, in Takeo province’s Tram Kak district. He graduated with a medical degree in 1992 and studied for a master’s degree in research from Chulalongkorn University in Thailand from 1996 to 1997. In 2008, he graduated with a doctoral degree in social science from Malaya University in Malaysia, according to his Facebook page. He leaves behind a wife, Bou Rachna, and four sons. His wife, who is now pregnant with their fifth child, said her husband could not have owed anyone money and did not want revenge against anyone. “He was a good person. I never worried that such problems would happen to him. I do not know why it happened to him like this. I am really sad,” said Mrs. Rachna. Mr. Ley knew the dangers of speaking out against the government and often spoke of what might happen to him because of his criticism.